"Nature is out of balance in the human world. The sun hasn't shone in years, and crops are failing. Worse yet, strange and hostile creatures have begun to appear. The people's survival hangs in the balance. To solve the crisis, the oracle stones are cast, and Kaede and Taisin are picked to go on a dangerous and unheard-of journey to Tanlili, the city of the Fairy Queen. Taisin is a sage, thrumming with magic, and Kaede is of the earth, without a speck of the otherworldly. And yet their two destinies are drawn together during the mission. As members of their party succumb to unearthly attacks and fairy tricks, the two come to rely on each other and even begin to fall in love. 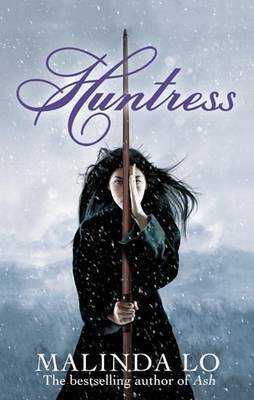 But the Kingdom needs only one huntress to save it, and what it takes could tear Kaede and Taisin apart forever..."
This is one of the best books I have read in ages. In fact it brings back memories of the old days, when Harry Potter was all the craze and YA fiction was barely known. I suppose Malinda Lo has managed to capture all the magical essence of a Childs book and weave into an amazing Teenage Fiction that I absolutely adored. I mean I finished this book within a day. I got it in the post, picked it up and was instantly gripped, and that’s not counting the beautiful cover. The book follows two girls on a quest to restore peace and natural weather back to a magical world. They encounter many things along the journey and it all keeps you entertained. I remember at the beginning of every chapter I would think ‘This will be my last chapter’ but it never was. There was always something exiting or thrilling happening and I always had to read on. I mean the book didn’t disappoint me; in fact it was better than I thought. It’s a beautiful and magical tale filled with lore, ledged and love. That’s the other thing that strikes me about Malinda Lo’s books; they are all so unique in their own special way. They all have their special twist, which is a lesbian love. With Ash I was skeptical about a lesbian Cinderella and I was even more skeptical about it in this book but Malinda lo seems to have pulled it off. The writing is so whimsical yet so deep. There are some very talented authors that have a certain way of describing things and Malinda can do that. Her descriptions are so vivid and clear. It’s almost as if you’re there. It’s the same with the emotions. Malinda doesn’t drone on and on about the emotion but you feel the same things that the characters do in the small amount of words allocated to how they feel. I suppose the main focuses of the story is the journey to the fairy kingdom and to save the land along with the love plot. I’ve honestly never read a book quite like this. I have never come across a book with such an amazing world, that is so totally unique, and this book is something new. I suppose the book tells us one thing. Malinda Lo has an amazing imagination and what does that tell us? We can expect great things from her. Out of the characters my favorites would have to be Con, Kaede and Taisan, only because as a group they have all the qualities main characters need. They are brave, strong, in love, and magical. That is why I like Tasian. She is this very meek little girl but if you get on the wrong side of her she’ll use her magic and blow you to bits. BOOM! Kaede I like because she’s adventurous. She kills the Fairy Queens daughter and gets the blood of a unicorn. I feel that world is unique but I recognize some of the mythology that has been pulled from other books. The other reason the mythology in this book is different is because it is very much Chinese which is nice to have a change from the general Greek myths or Vampires (though I can’t get tired of either of those genres). The book is truly magical and Malinda Lo is one amazing author. I cannot wait to see what she has in store for us next, but I will get my hands on it!